​Visit Gillian's website for details. Six new paintings at Greater Victoria Public Library, July 31- August 19. Showing in About Face! at Martin Batchelor Gallery, 712 Cormorant St, August 15-27. Gallery of the Cowichan Theatre, Duncan, August 22 opens. Digital Prints on Canvas: Two superb, high resolution images of her recent paintings are now available. Below: Images from On the Bus series. Please contact Gillian for sizes, prices and delivery. Click HERE for details and info. A full-time professional artist since 2003, Gillian paints at Xchanges Gallery & Studios in Victoria. 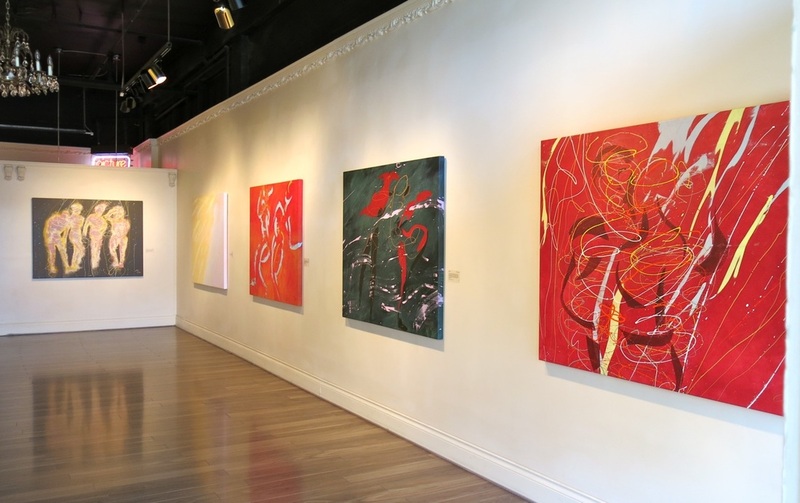 Her new series Energetic Universe graced the Martin Batchelor Gallery February 7- March 5, 2015. Energetic Universe refers to the forces that create and sustain our physical world and human relationships. 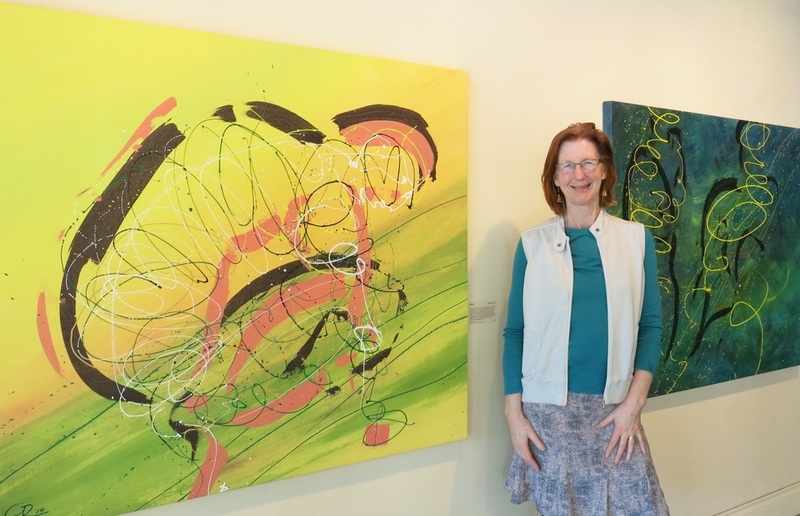 “I paint abstracted human forms in harmonious connection,” she says. Born in Wales, the artist received in-depth instruction on colour application, gesture, line and tone at the Cardiff College of Art. “We stood all day long, 60 students packed in a room,” she recalls, “experimenting with charcoal and mixing colours for weeks.” Gillian credits her development as a painter to this early immersive experience. Gillian Redwood in her studio at Xchanges. 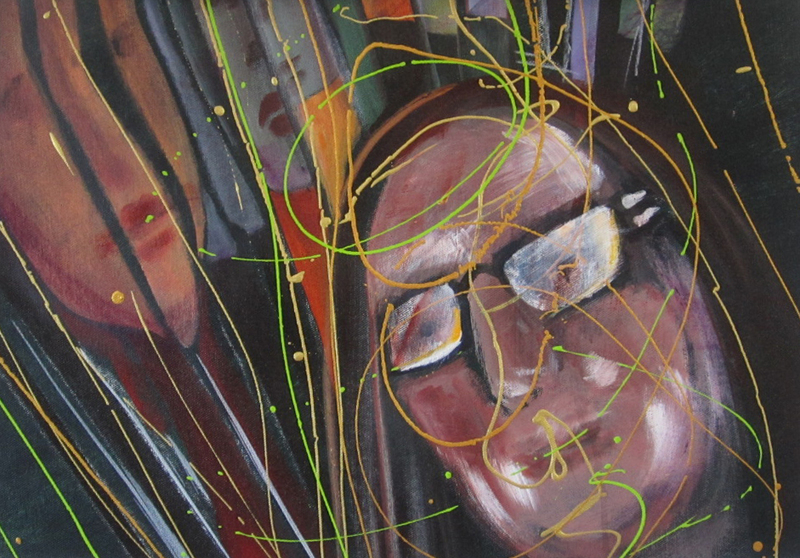 The artist uses dynamic line and brush work to express the inner essence of forms. She is fascinated by the science of optics and behaviour of light on a molecular level. Sketching with pastels first, she brings together various elements in the final painting. “I work quickly and in short bursts, she says, “usually covering the entire canvas in one session.” Adding layers of colour changes the shape and density of existing forms. She’s often delighted by the soft sparkling light captured by her mark-making. Gillian’s artwork is informed by periods of work and study in creative meccas around the world. The intrepid traveller has rented a studio/gallery in St Ives Cornwall, facilitated community art projects in Wales, studied Polynesian culture in Hawaii, and lived for ten months in Italy. Before moving to Victoria in 2012 with her partner, Gillian operated a studio/gallery in Nakusp, north of Nelson BC. Gillian is a gifted teacher who inspires her students to access their creativity through “Painting without Borders” and “Expressive Painting”. Skilled at engaging with community, Gillian has participated in the Moss St Paint-In and ARTISHOW for the past two summers. 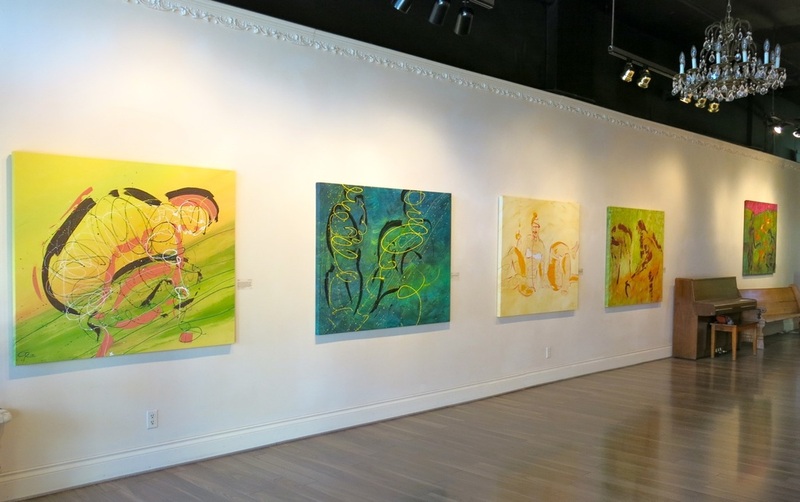 In 2014, she mounted a solo show at Saanich Municipal Hall and the Greater Victoria Public Library. THE FOUR by Gillian Redwood, acrylic on canvas, 46x57in. 2014. 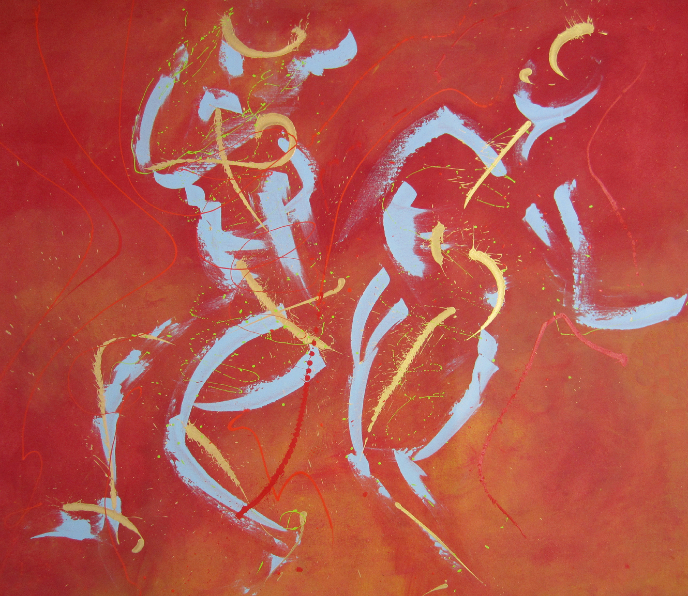 The first work completed in the Energetic Universe series talks about communication through movement and gesture. Four semi-transparent bodies are silhouetted on a dark ground. The spiraling gold lines represent streams of energy from the cosmos. Some of the particles become “embodied” while others cascade on through space. MYSTIC by Gillian Redwood, acrylic on canvas, 46x57 in. 2014. In Mystic the figures are reduced to elemental shapes, with no shimmering energy apparent. 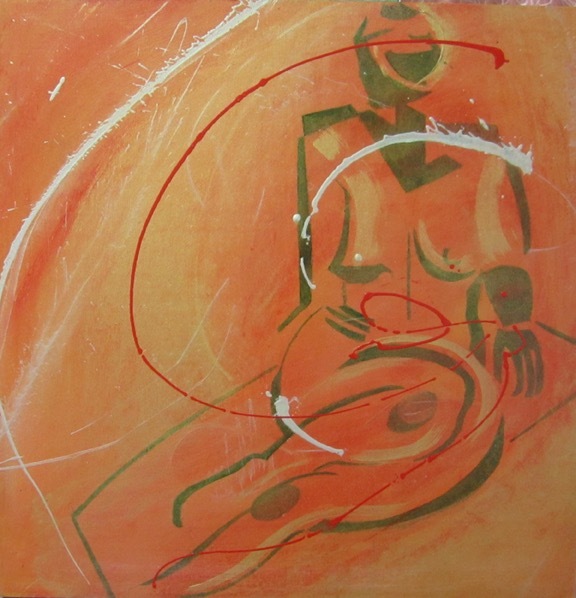 The artist uses a large palette knife and sweeping gestural strokes to capture the vitality of the silhouetted forms. Bold rusty-reds with blue-gray accents hover over a greenish-gold ground. 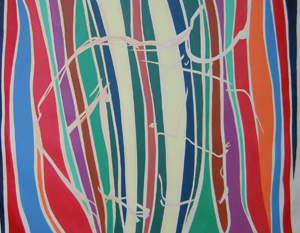 PIQUOIA by Gillian Redwood, acrylic on canvas, 46x57 in. 2014. Piquoia is a word-title invented by the artist. “The crouching figure isn’t a real person,” says Gillian, “but a mythical symbol of strength and energy.” The figure is coiled like a spring ready for action, propelled by the vigorous diagonal flow of the composition. Bold lines in strong hues give a dynamic outline to the primal power source. TERRA FERMA by Redwood, acrylic on canvas, 46x54 in. 2014. BLUE HOST by Gillian Redwood, acrylic on canvas 46x57 in. 2014. LIDO by Gillian Redwood, acrylic on canvas 46x54 in. 2014. While vacationing in Italy, Gillian made sketches of sunbathers. “Many people still smoke in public places,” she says, “and this woman is relaxing on the beach with a cigarette.” The painting exudes warmth and contentment through a soft sandy palette, chunky rounded forms and informal gestures. The woman rests one hand on the sand, while smoke curls from the other. Balance and harmony prevail in the repeated simplified forms and broad swaths of ochre paint. 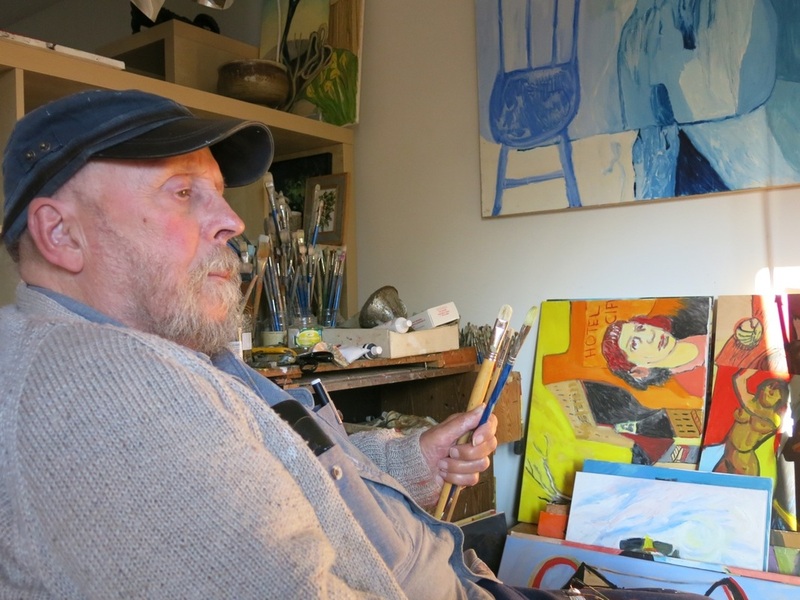 Gillian recently spent an afternoon with Jim Gordaneer, a well-respected expressionist painter who exhibits at Winchester Galleries Modern. “It is always a pleasure to share time with a fellow painter,” says Jim, “and Gillian is devoted to her professional practice.” Jim’s comments on Gillian’s paintings are below. Jim Gordaneer in his home-studio, Nov 2014. Gordaneer praises the visual drama in The Four. The dark ground sets off the golden figural shapes and the limited palette of two or three colours adds focus. “Many painters use too many colours,” he says. In Blue Host, Gordaneer appreciates the rich shading in the blue/green background. “Moving from light to dark, the activity in the ground is very effective and serves her well,” he says. In Mystic, Gordaneer comments that the dancing figures appear as gestural marks on the light green ground. “The accenting rusty-red colour is gorgeous,” he says. A similiar warm red illuminates Terra Ferma. Used in a painterly way, the earthy tone outlines the active bodies and tools. “This repetition of colour unifies the painting by giving a sense of connection between figure and ground,” he says. 712 Cormorant St, Victoria from Feb 7-Mar 5 2015. Opening with artist in attendance, February 7, 7-9pm. Below: Energetic Universe installed at the Martin Batchelor Gallery; Gillian Redwood with two artworks. from the University of Victoria. This website and its content is copyright of Art Openings, 2009. All rights reserved.